‘A stunning read from a superb storyteller.’ Clare Mackintosh From the #1 ebook and Sunday Times bestseller, comes the tale of a young woman in search of her past, and the mother who will do anything to keep it hidden… What if you were the worst crime your mother ever committed? Dahlia Waller’s childhood memories consist of stuffy cars, seedy motels, and a rootless existence traveling the country with her eccentric mother. Now grown, she desperately wants to distance herself from that life. Yet one thing is stopping her from moving forward: she has questions. In order to understand her past, Dahlia must go back. Back to her mother in the stifling town of Aurora, Texas. Back into the past of a woman on the brink of madness. But after she discovers three grave-like mounds on a neighbouring farm, she’ll learn that in her mother’s world of secrets, not all questions are meant to be answered… The Good Daughter is a compelling take on a genre that shows no sign of slowing down. The perfect read for fans of Gillian Flynn and Paula Hawkins. Having previously read and loving one of Alexandra Burts books when i spied this on netgalley, it was a given that i would request it. We follow the journey of Dahlia Waller as she returns home and is seeking answers, her only memories of her childhood are in and out of cars, motels and never having the paperwork. After she heads out for a run one morning and finds something horrific - she needs these answers more than ever. This is a real twist and turn taking tale told over years and memories from different perspectives and it didn't feel like a thriller in the typical sense to me. It was something different, I however didn't manage warm to Dahlia, i really wanted to but there was something about her character that didn't warm my heart. As we start to learn more about Dahlia and her mothers pasts i felt that Alexandra really tried to build a world where things were so much more different then than they are now. 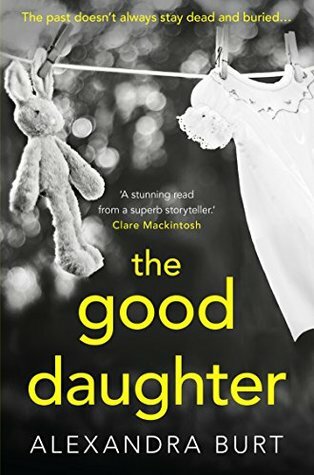 The good daughter was a very cryptic tale and takes the reader on a journey through a lot with Dahlia, but parts of the the plot just didn't work for me, i really wanted to love this as much as i loved her other work - but i just couldnt. Whilst i loved the concept, and the questions it led me to ask - this wasn't really for me. I felt parts for me as a reader were a bit too far fetched and i can understand how for others this would really appeal and work for others. It's a real shame that i didn't love it more, but give it a go yourself - because it might be perfect for you. Born in Fulda, Germany, a baroque town in the East Hesse Highlands, I spent my childhood accompanying my two older brothers on local countryside adventures, roaming abandoned farm houses, ancient beech woods cratered by WW2 bombings, and sandstone towers rumored to have housed witches waiting to be burned at the stakes. A gluttonous reader long before online bookstores, grocery store crime novels, and large book chains cropped up in every city, I made do with a small town library in the city hall building. After I exhausted the children's section, I moved on to crime fiction and serial killers. While pursuing literary translations, I decided to tell my own stories. After three years of writing classes and gluttonous reading, my short fiction appeared in the Freedom Fiction Journal, All Things Girl, and MUSED Literary Review. I currently live in Central Texas with my husband, my daughter, and two Chocolate Labrador Retrievers. I am currently working on my third novel.